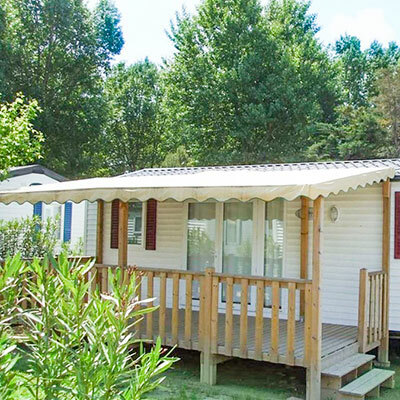 Recent and cosy mobile home with a large terrace, the Encierro is ideally configured for a family of 4 people. An additional extra bed can accommodate a 5th holidaymaker if necessary. The rental of 24 m2 has two separate bedrooms: the first furnished with a double bed, the second with two single beds. A shower room and toilets are also available on either side of the living room. For your comfort, the living room includes a pleasant lounge area with bench and television. The open kitchen is very well equipped: with a sink, cooking fires, a refrigerator-freezer and a microwave oven, it offers you total autonomy in preparing your meals, for practical and economical holidays. There are also small electrical appliances such as the electric coffee maker. 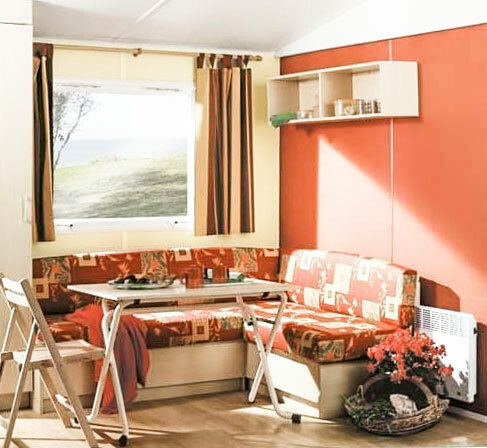 Very comfortable, the mobile home Encierro is equipped with air conditioning: it therefore ensures you a most relaxing stay, during which you will spend nights in the cool. Adjustable and reversible, air conditioning allows you to adjust the temperature of your rental to your taste, to enjoy a tailor-made atmosphere! Another highlight of the Encierro is its wooden terrace, with a surface area of 13 m2: bounded by a balustrade and covered by an arbour, it constitutes a comfortable space to enjoy the outdoors. You can enjoy daily meals with your family, share aperitifs and grills, and relax for a long time in the evening thanks to the outdoor lighting. A garden furniture composed of a family table and outdoor armchairs awaits you.